Posted March 29, 2019 March 29, 2019 District Lodge 837 Comm. 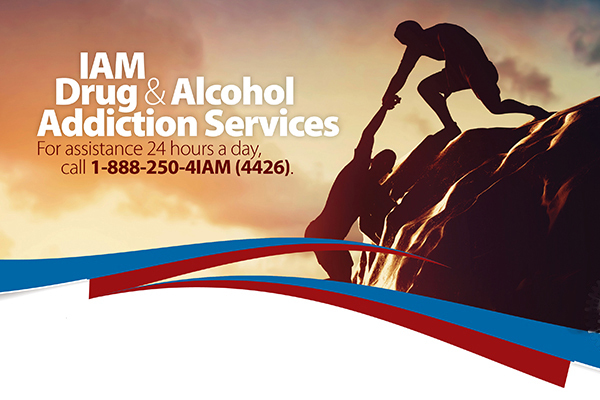 Earlier this year, the IAM launched the Addition Services Program to help find help for members and their families who are struggling with drug and alcohol addiction. With the launch of their Facebook page, the program now has a social media presence. Please give the IAM Addiction Services Facebook page a like and share it with your friends to spread the word about this useful benefit for Machinists Union members. IAM Addiction Services include assessment, placement into a treatment facility, follow up and aftercare. These services are available to all dues-paying IAM members and their eligible family members. Assistant Director of the IAM Employee Assistance Program Vinny Ceraso is in charge of IAM Addiction Services. For assistance 24 hours a day, Ceraso can be contacted at 1-888-250-4IAM (4426).